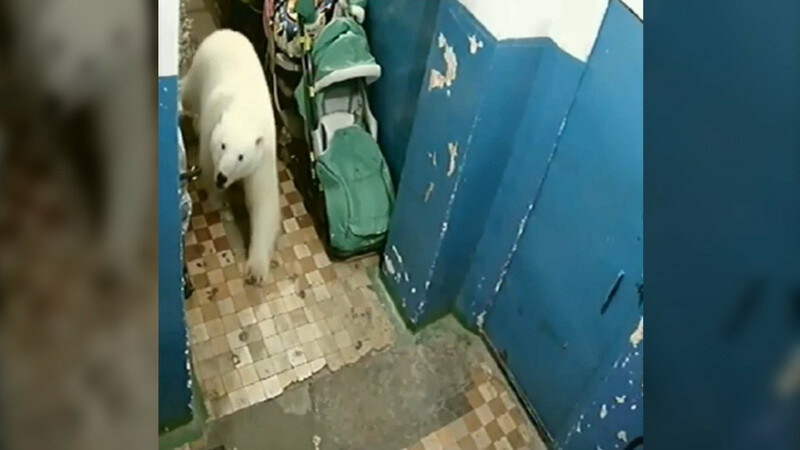 A polar bear has been filmed walking into apartments in the Russian Arctic archipelago of Novaya Zemlya, where locals are facing a massive “invasion” of the wild animals. CCTV footage shows the bear strolling down the snowy streets of Belushya Guba. Then the furry beast is seen circling in the lobby amongst baby strollers and other belongings. The video was filmed on January 21 but emerged online recently after news about a “polar bear evasion” grabbed headlines in Russia. The worrying migration of bears began late last year when the animals started to flock to the settlements of Novaya Zemlya en masse, seeking food at local dumps and harassing residents and their pets. The locals erected some fences and tried to scare the predators off using vehicles and by firing warning shots. But these measures seemed to have only worked as a temporary solution because the polar bears keep returning.